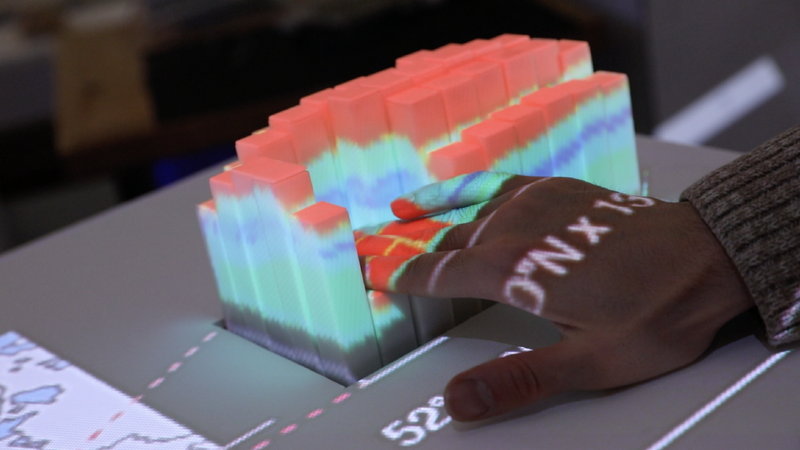 Engineers at MIT’s Tangible Media Group have designed inForce — a force-controlled, pin-based shape display capable of providing real-time variable haptic feedback in response to the way users press the display’s pins. “The display enables people to ‘press through’ computationally rendered dynamic shapes to understand the internal structure of 3D volumetric information. We also demonstrate a material property capturing functionality. Our technical evaluation and user study assesses the hardware capability and haptic perception through interaction with inFORCE. We also explore application spaces including bio-medical data and geo-science data representation. The inForce display features a series of 19.2mm 3D-printed square pins, which are driven by QUICKSHAFT linear actuators powered by motor drivers, and controlled by 10 Teensy 3.2 boards via CAN. The actuators are designed with a three-phase self-supporting coil and three Hall sensors that offer micro-positioning applications. 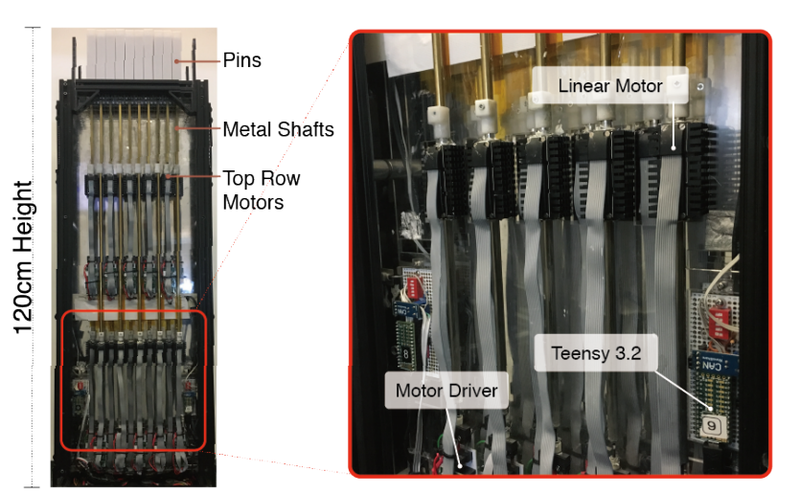 The motor drivers have their own PID for position control, which is provided by the Teensy based on the sensor data that includes position and drawing current. It’s the drawing current data that’s used to detect force, and thereby driving certain amounts of haptic feedback on the pins. To demonstrate some of the display’s applications, such as bio-medical and geoscience, the engineers used a projector to map images on three sides of the pins, and a USB camera for capturing the appearance off scanning objects. For example, they can display a picture of a person’s arm, allowing others to feel a pulse when pressed hard enough. While viewing an image directly onto the pins will provide an increased sense of realism, the engineers are looking into incorporating AR and VR for the display, which would bring a new level of immersion to their platform. MIT’s inForce Brings Haptic Feedback with Force Controlled Shape Display was originally published in Hackster Blog on Medium, where people are continuing the conversation by highlighting and responding to this story.